One exciting, innovative effort to organize such an area-wide unions took a step forward this week when a federal judge dismissed a legal challenge from (guess who?) the U.S. Chamber of Commerce to a Seattle law allowing Uber, Lyft and taxi drivers to come together into a single union of all for-hire drivers. Without something like this, the entry of Uber and Lyft drivers into a market tends to result in both an excess supply of workers and to low pay for drivers — as we blogged about when Pittsburgh was first going gaga about Uber. Of course, in some markets (including, we are told, Pittsburgh) the pre-ride sharing market consists of (or consisted of) exploited independent contractor taxi drivers. In that case, Uber and Lyft may only make a bad situation for drivers a bit worse. In fact, if the entry of ride-sharing companies opens up new possibilities for organizing a union of all drivers, it could end up being a positive development (as we noted here). The Seattle International Brotherhood of Teamsters understood these dynamics a few years ago, as David Bensman wrote about in The American Prospect. 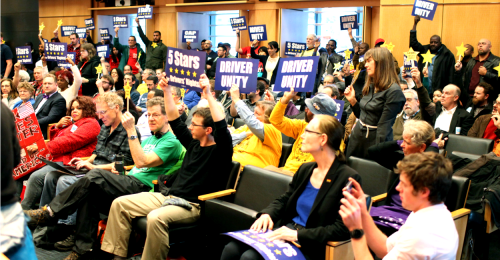 The Teamsters organized a campaign for City Council elections in 2015 that persuaded 16 of 18 candidates to endorse a "For-Hire Drivers' Bill of Rights" that would give unionization and bargaining rights to all drivers. This bill capitalized on the fact that, as "independent contractors," drivers are not covered by the National Labor Relations Act. This means the state — and, in Seattle, the locality — may have the ability to grant them union rights. Legal procedures on the Seattle law are not done yet. The U.S. Chamber will appeal this week's decision. And there's another legal challenge to the law from (guess who?) the National Right to Work Legal Defense Foundation and the Freedom Foundation. Like the U.S. Chamber, these groups can't abide by the concept of an American worker with a decent income distribution like in times past or a politics in which working people have a more powerful voice. The current legal terrain for the effort in Seattle — and for any similar effort in Pennsylvania — may be murky. But, at the end of the day, if we want these workers to have the ability to be part of a thriving middle class, we have to allow something like a union of all for-hire drivers. Such a union would (a) enable drivers to support their families without driving 60 or 70 hours per week; and (b) not impede competition among ride platforms. That's what we want: constructive competition between technology platforms, not destructive competition based on wages. So...let's all give a cheer to Teamsters local 117 in Seattle! With innovation in union forms and social policy alongside IT and hard technology innovations, we can begin to recreate an economy that works for all.